Located in the heart of the city, Kuala Lumpur Lake Gardens contain many of Malaysia's most popular tourist attractions including KL Bird Park (the world's largest walk in aviary), a butterfly park, a deer park, orchid and hibiscus gardens and some top museums. There is so much to see you will want to visit again and again. However if you are short of time you can use this guide and map to help you cover the main highlights of the park in one day. Kuala Lumpur has always been a green town whose streets are lined with banyans and raintrees and patches of thick jungle intersperse with developed areas. But in recent years, due to rapid urbanisation, the green areas have somewhat diminished which adds to the importance of retaining 'green lungs' like Kuala Lumpur Lake Gardens. The Lake Gardens are known by many name including Taman Tasik Perdana and Perdana Lake Gardens, but in July 2011 the park was renamed Taman Botani Perdana as part of an ambitious plan to transform the 123 year old lake gardens into a world class botanical garden covering over 100 hectares. Together with the surrounding attractions the whole area is known officially as Tun Abdul Razak Heritage Park. My Kuala Lumpur Lake Gardens Trail begins at the National Monument, an imposing bronze statue on a low hill facing the Lake Gardens. This monument was designed by an American sculptor, Felix de Weldon, and completed in 1966. 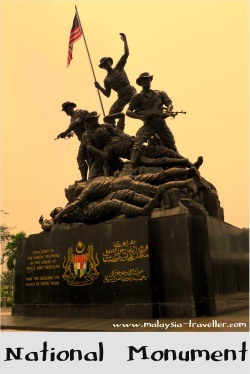 It commemorates the warriors who died defending the sovereignty of Malaysia. In the same vicinity is a Cenotaph listing the names of (mostly British) servicemen from the Federated Malay States who were killed during World War One (1914-1918), with later additions to cover WWII (1939-1945) and the Malayan Emergency (1948-1960). There is a small restaurant nearby, Tugu View Cafe, with a terrace overlooking the Monument where you can take refreshment. At the foot of the National Monument is the Asean Sculpture Garden which is worth a quick look. It contains six sculptures of stainless steel, glass, marble and bamboo made by artists from Asean nations in the days when Asean was made up of only 6 countries. Next, after taking care while crossing the busy Jalan Parlimen, enter into the Lake Gardens park, signposted Taman Botani Perdana. Here you should visit the Malaysia Cartoon & Comic House to see some original cartoon artwork. From here take one of the footpaths leading down to the main botanical garden area next to the lakes. 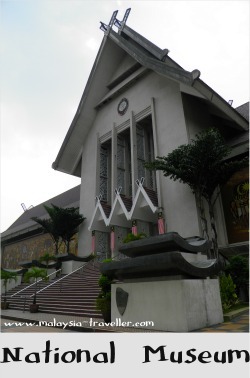 You will pass a large amphitheatre (Panggung Anniversari) where shows and cultural events are staged periodically. fish pond, rowing, boathouse, jogging paths. 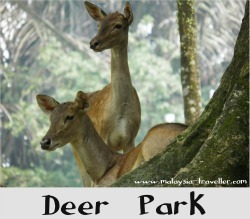 Be sure not to miss the Mouse-deer and Deer Park (Taman Rusa dan Kancil). The mousedeer are cute little things but very shy and you will be lucky to get a good photo. The larger more common deer on the other hand are less camera-shy. You can sometimes buy food for the deer at the entrance to the deer park if anyone is on duty. Next I suggest a visit to the Orchid & Hibiscus Gardens. This is a park-within-a-park with its own entrance. There is a nominal admission charge at weekends but it is free on weekdays. There are hundreds of specimens of orchid and hibiscus to enjoy here. The hibiscus (or bunga raya) is the national flower of Malaysia. Across the street is the excellent KL Bird Park. 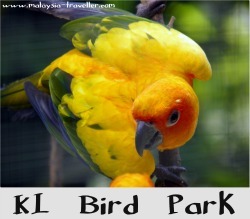 It claims to be the world's largest free flight aviary and it is one of Malaysia's most popular tourist spots. This is reflected in the entrance charge which, by Malaysian standards, is fairly expensive, although still good value compared to other countries. While you are here you can take the opportunity to have lunch on the terrace of the Hornbill Restaurant. 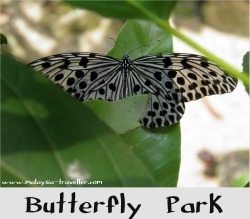 Also nearby is the Kuala Lumpur Butterfly Park where you can see thousands of butterflies flying freely in lush tropical surroundings enclosed under a giant net. An entrance fee is charged. Further along Jalan Perdana can be found the Tun Abdul Razak Memorial, the former official residence of the late Tun Abdul Razak, the second Prime Minister of Malaysia, and now a museum which houses an interesting collection of memorabilia, gifts and personal possessions. The bedroom and study of the former Prime Minister have been preserved with their original furnishings and interior design students will be fascinated to see how tastes have changed since the 1970s. 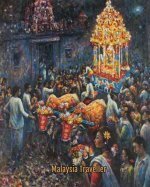 Tun Abdul Razak was a popular Prime Minister and was known as the Father of Development. Round the back of the memorial you take a quick look at the Felda Settlement House or Rumah Felda. 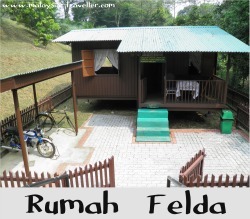 The Federal Land Development Authority (Felda) provided modest pre-fabricated homes of this sort to low income families under their settlement scheme. Originally there would have been only one water pipe for every 6 families but nowadays each home has its own water supply. Still have energy left? If so take a look inside the nearby Police Museum and the splendid Islamic Arts Museum. Also in the vicinity are the National Planetarium and, a little further away, the National Museum. This completes our Kuala Lumpur Lake Gardens Trail. From here you could either get a taxi or walk across to KL Sentral for your train, monorail or bus connections. 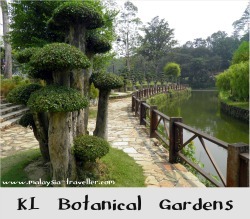 Kuala Lumpur Lake Gardens: 9am - 6pm daily. Free Admission. Too much to see in one day? Perhaps you want to stay somewhere nearby? The Carcosa Seri Negara is a luxurious all-suite heritage hotel housed in the former residence of Britain's senior representative during colonial times. It is located on the edge of Kuala Lumpur Lake Gardens (in fact the gardens, or part of them , once belonged to the house. If your budget does not stretch to this type of accommodation you could still visit the hotel for one of their famed afternoon teas served in the garden. 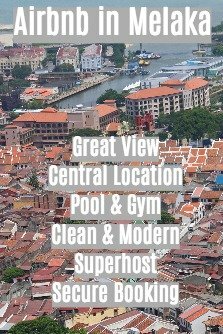 Other hotels in the vicinity include the Hilton Kuala Lumpur and Le Meridien Kuala Lumpur, whose near identical twin towers stand at the southern edge of Kuala Lumpur Lake Gardens, next to KL Sentral.